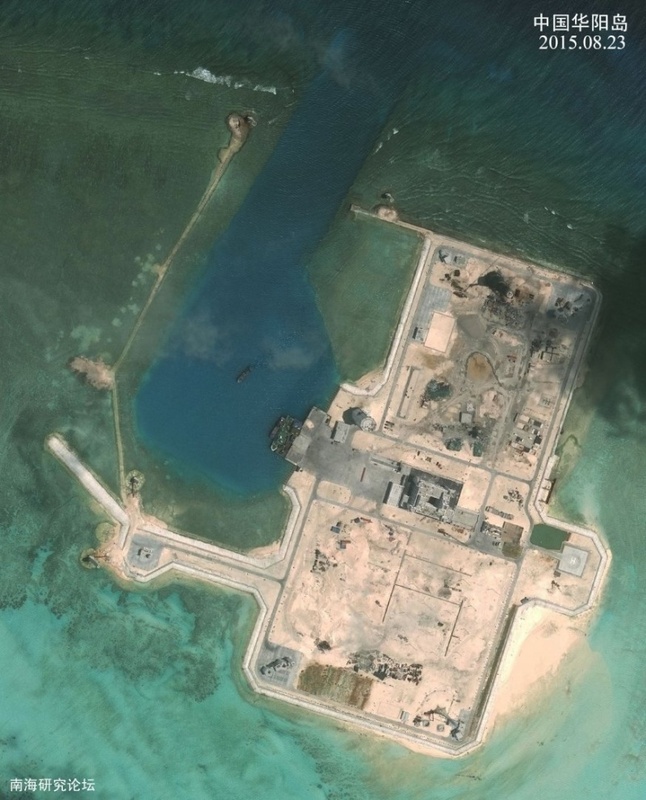 World War III in the South China Sea? The Cold War between the US and 2.0 Russia is far from being defused, the last thing the world needs is certainly a reincarnation of the falcon Donald Rumsfeld. Instead, we are entitled to a known-known predictable in the person of the Supreme Pentagon chief Ash Carter. Ash the neocon made quite a show at the Shangri-la Dialogue last weekend in Singapore. 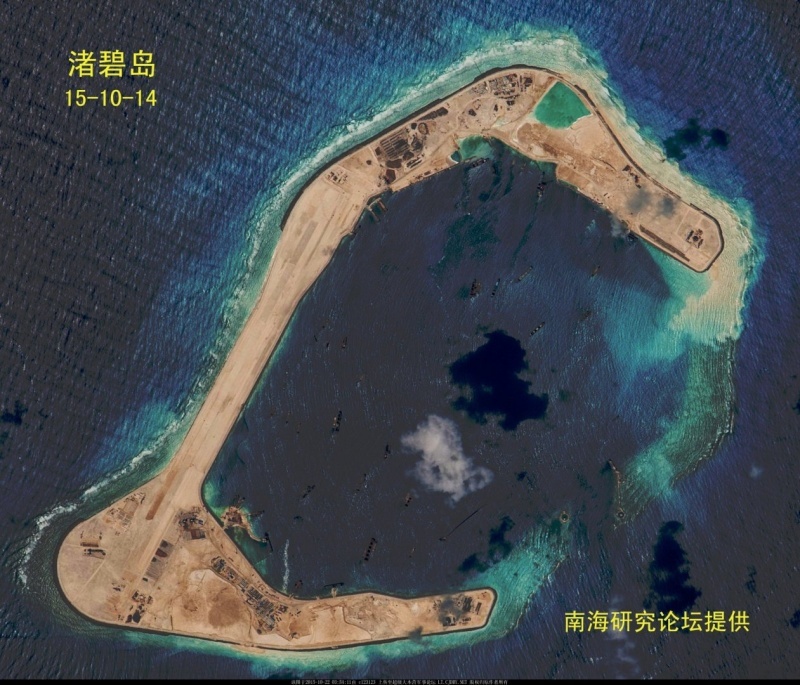 Beijing is working to fill work nine artificial islands in the South China Sea, seven in the Spratlys Islands and two in the Paracels islands. 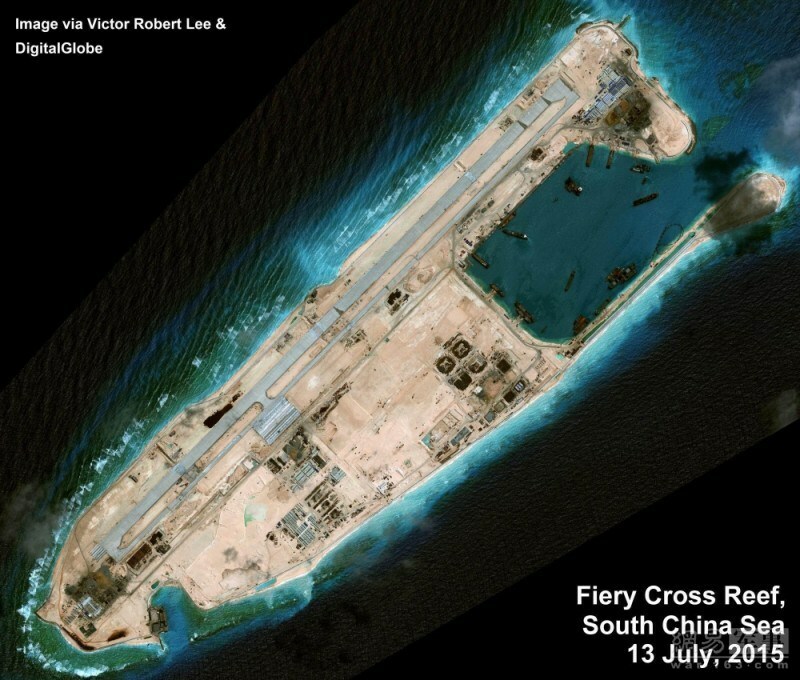 Ash flatly demanded Beijing immediate and lasting cessation of expansion, judging that his behavior was not in line with international rules, then leave Singapore flying over the Straits of Malacca on board a V-22 Osprey. After Shangri-la, the US President Barack Obama felt the need to take the ball stressing that China should respect the rules and stop playing elbows, while acknowledging that some of their claims may be legitimate. And what else? Be a power in the Pacific gives you the right to vote on everything! Putting into perspective the whole situation, the Prime Minister of Singapore Lee Hsien Loong has at least tried to put a good stating that the Pacific Ocean was large enough for both Washington and Beijing. 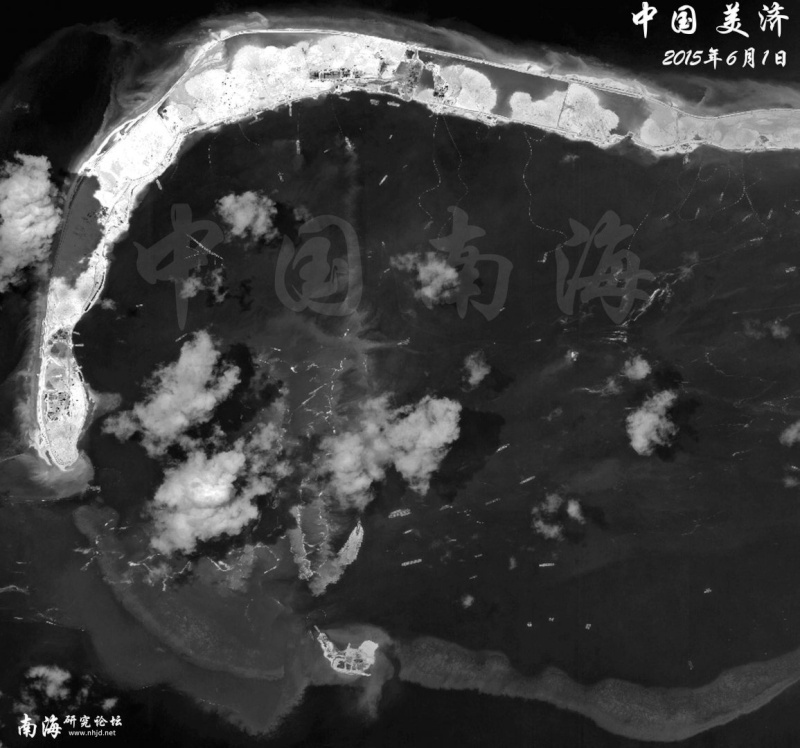 So here we are brought back into a two square kilometers area formed by rocks, islets and atolls surrounded by 150,000 square kilometers of water (literally) disorder, thousands of kilometers of the eastern coast of China. 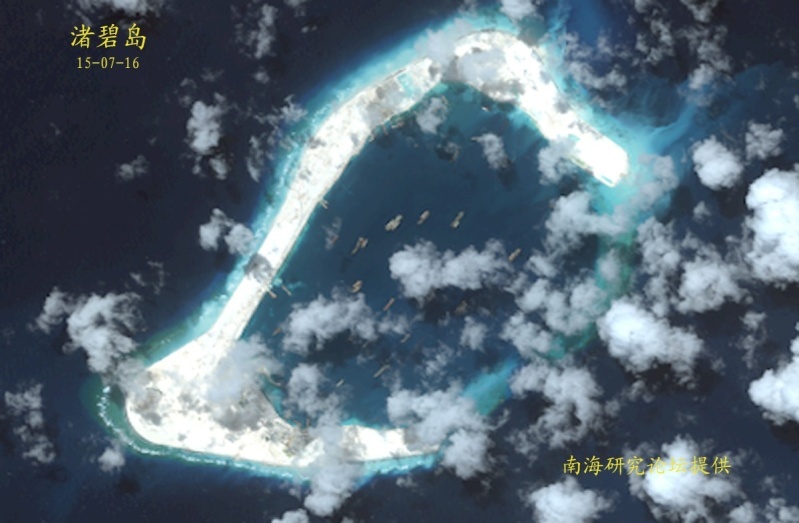 Beijing claims to exercise an undisputed sovereignty over at least 80% of the South China Sea. The issue in question is not limited to unexplored oil and gas reserves estimated at at least 5000 billion. The area is in fact in the middle of a hyper busy waterway of crucial importance for the world economy, for which the countries of Europe and the Middle East as well as China, Japan, South Korea and many of the member countries of ASEAN (Association of Southeast Asian Nations) are transit trade of energy and a myriad of other products. The end of inadmissibility of the Chinese Ministry of Foreign Affairs sent to Ash Carter was quite detailed. The essential point is that the South China Sea guideline should be (in fact, it will be) traded between China and ASEAN, which everyone knows in Southeast Asia. The decisive factor is that in how Beijing sees it, all this has nothing to do with the USA. Talk to the neocons of the caliber of Ash. The unfeigned fear of neocons is that Chinese aggression transforms these waters Mare Nostrum of the People's Republic of China. Is that since the end of World War II and the Japanese surrender, Pacific Power has appropriated the title of Lord of the Pacific, from Asia to California. It is easy to see that things will end badly, because the new determination shown by China to assert itself could spell the end of the hegemonic power. What will Ash? 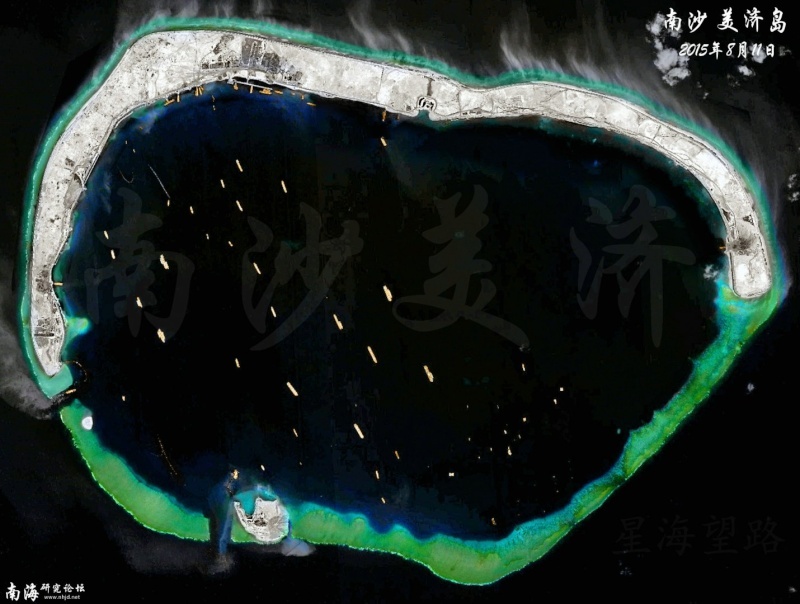 If he is true to his word when he says that the US wants to remain the main military power in East Asia in the coming decades, it will send a naval fleet to block a large section of the Chinese east coast. 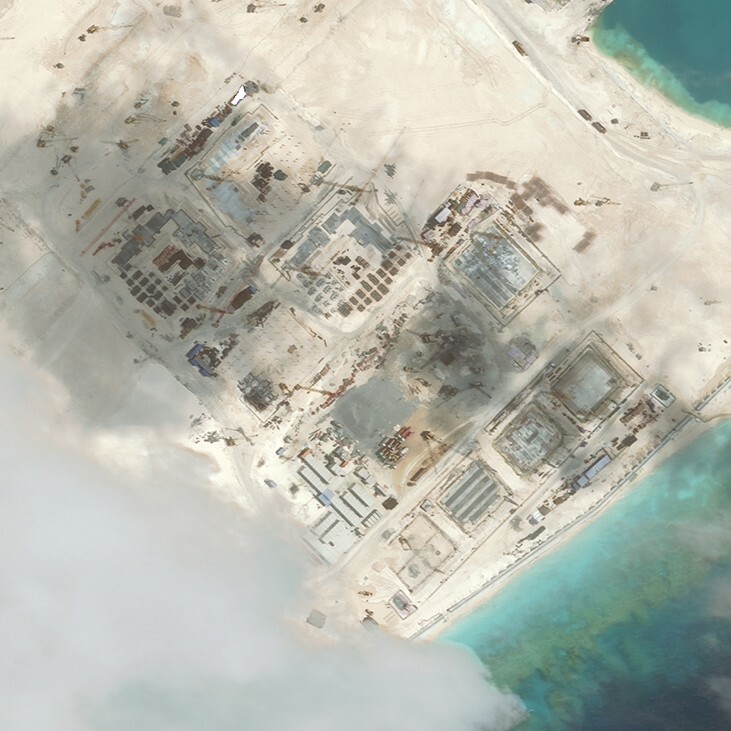 Do not you hear the ticking bomb ticking geopolitics in the South China Sea? 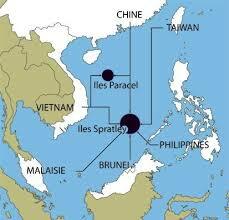 In South China Sea we have Vietnam, Malaysia, Brunei and Taiwan who oppose China. In the East China Sea is Japan, Taiwan and South Korea who oppose the same China. 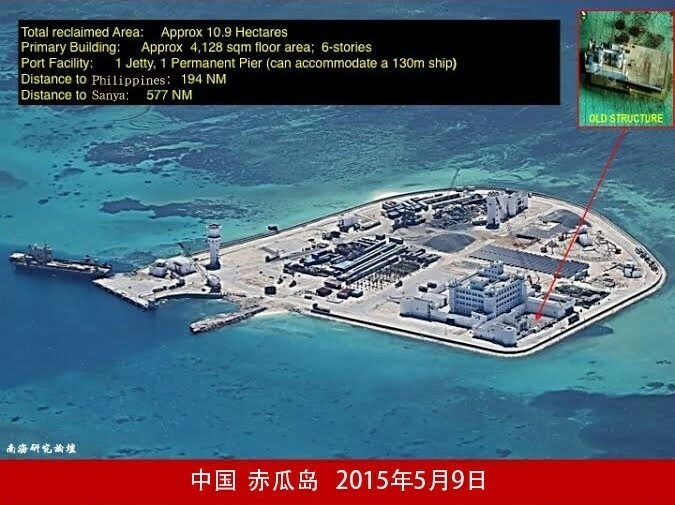 Beijing swear that there is no air defense identification zone in the South China Sea planned at this time because the conditions do not permit. 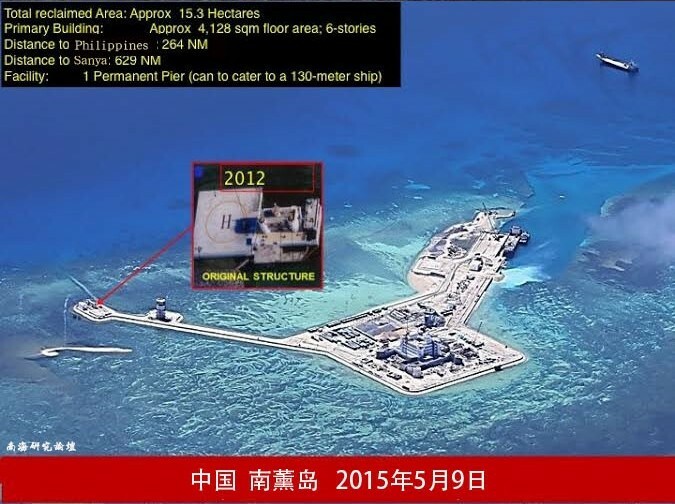 Let us remember that after the announcement of such a zone in the East China Sea at the end of 2013, the Pentagon sent a few B-52 a wander. The tension was and is (relatively) low (so far). The notion that China is an evil dragon about to engulf all the minions around does not hold water. 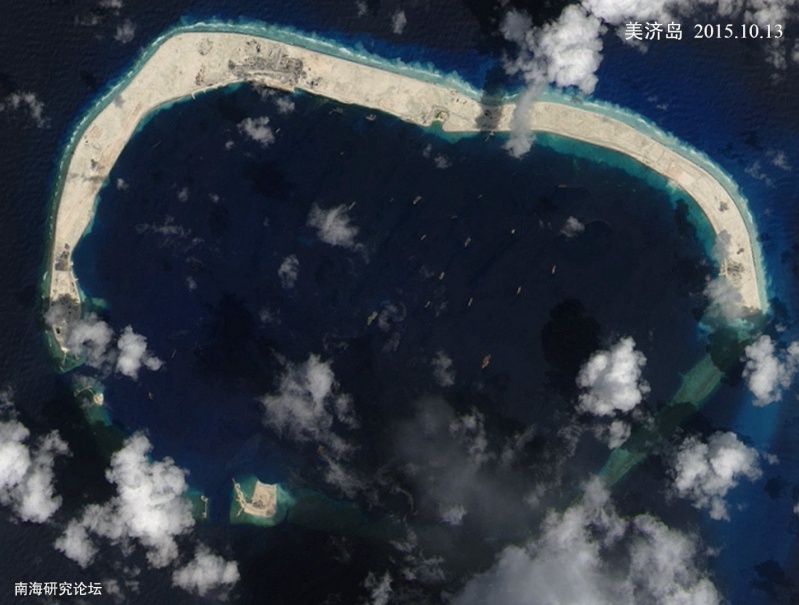 Long before the commander of the Pacific Fleet, Admiral Harry Harris, would complain of building a great wall of sand in the South China Sea, other regional players were far from being mere spectators amorphous . 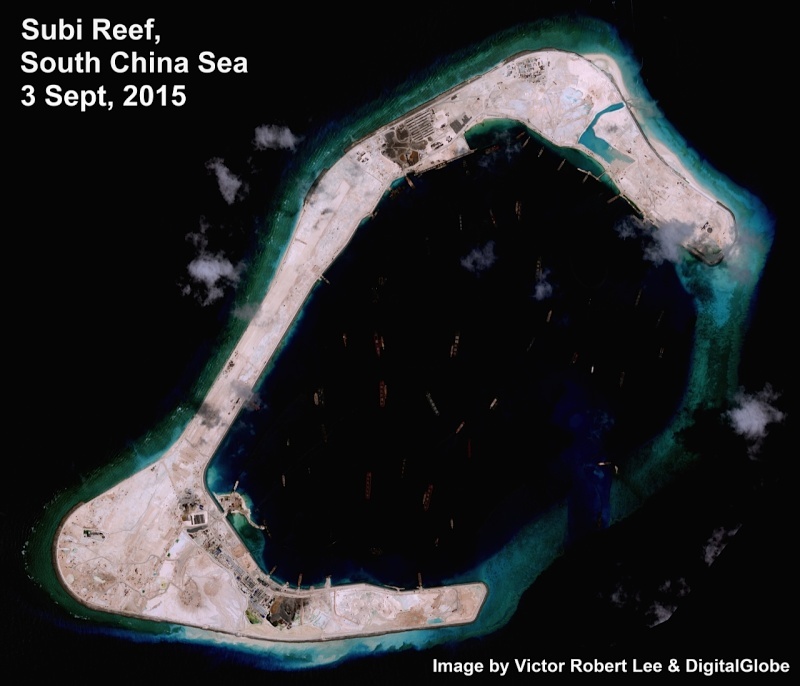 For years, China (and Brunei) had no airstrip in the South China Sea. The Philippines have one on Thitu island. 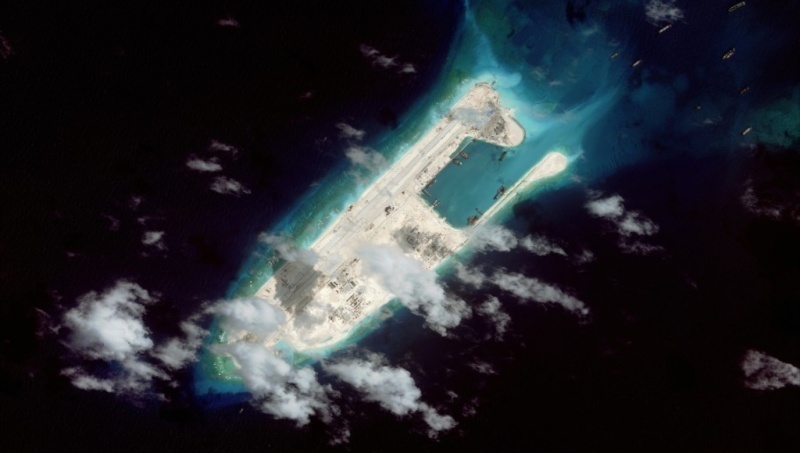 Vietnam is one, plus a heliport, at Truong Sa Malaysia is one of the Shallow reef, where many military aircraft are located. Taiwan has a military airport on the island of Taiping. 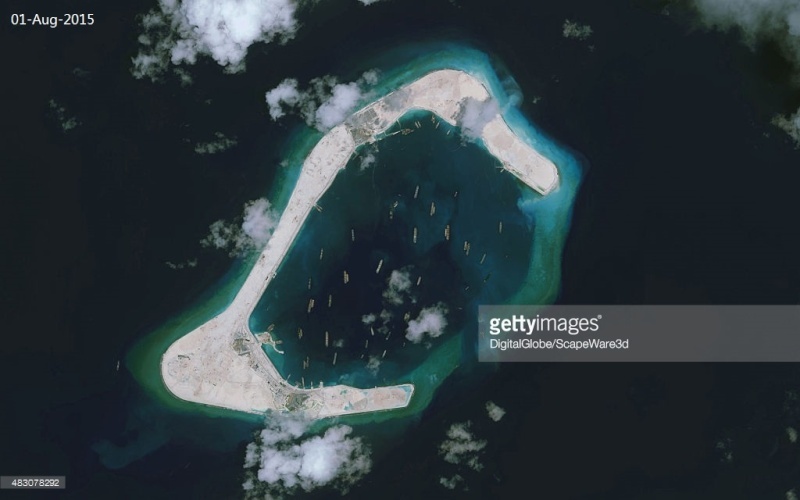 Beijing could surely use artificial islands to deploy to any aerial and naval hardware. But China is not the only one to perform fill work. 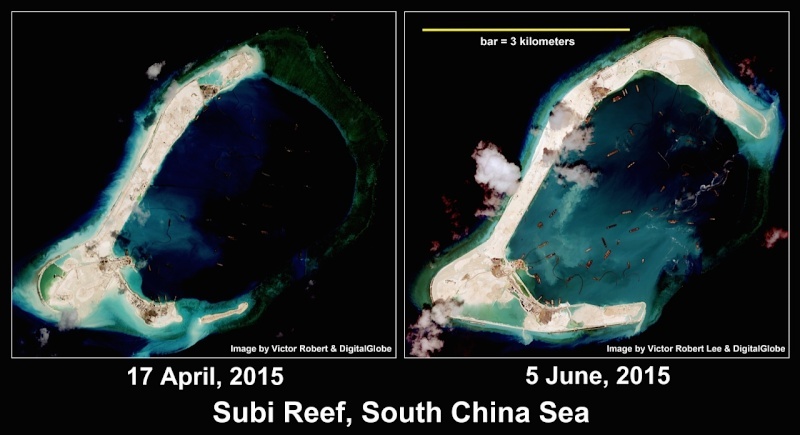 Vietnam is the same on two atolls in the Spratlys. 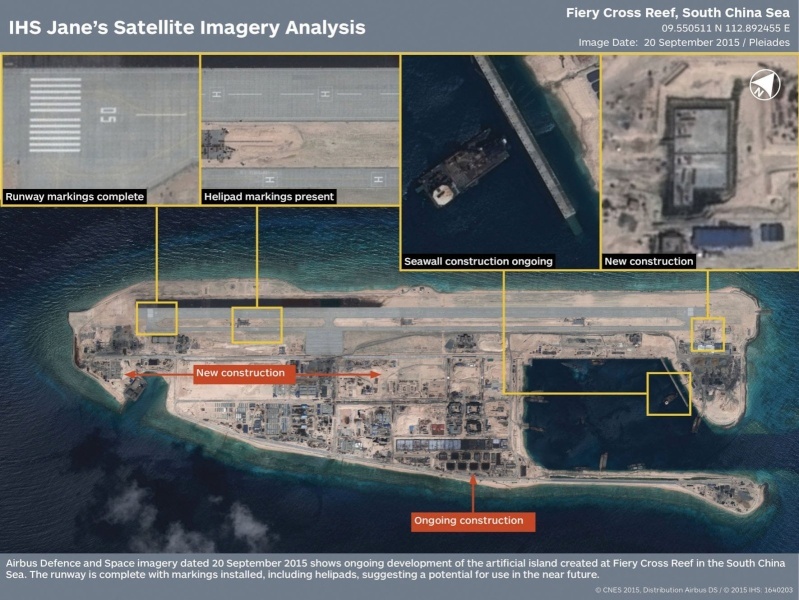 For its part, Washington gained access to eight bases in the Philippines, including the naval base of Carlito Cunanan, which is the heart of the action in the South China Sea. Manila, which is the weakest link in the region, put on a two-pronged strategy: the unconditional support of Washington and the internationalization of everything concerning the South China Sea. 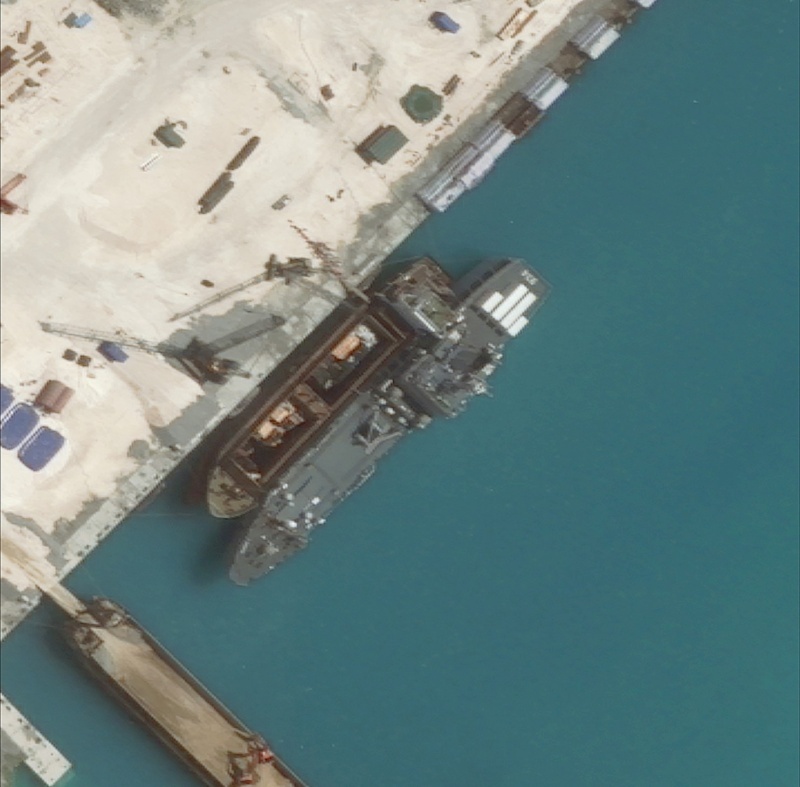 For its part, Taiwan is busy investing in its stealth missile corvette; ultra-mobile, heavily armed, and which requires little maintenance. There is also the commander of the Seventh Fleet of the USA, Vice Admiral Robert Thomas, who welcomes the active role played by the Japanese not only in the East China Sea, but also between the Pacific and the Indian Ocean. We must not delude ourselves, Washington authorizes the remilitarization of Japan. 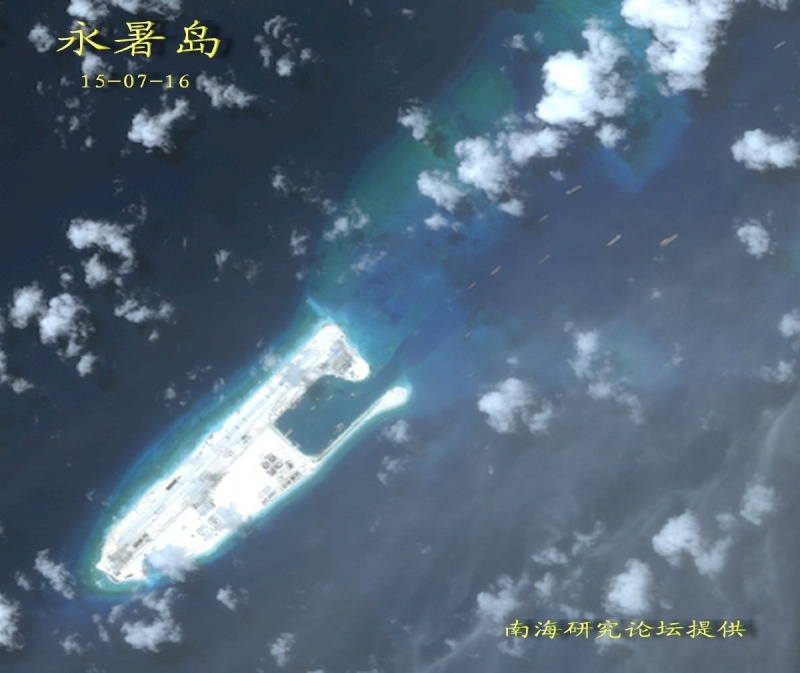 The time is therefore ripe to monitor closely what happens in South and East China Sea, including any dangerous pretext casus belli between the declining hegemonic power and resurgent power that has stopped playing low profile. A version of Cold War Won Ton, it would please you? The stage is set for an extremely dangerous game. 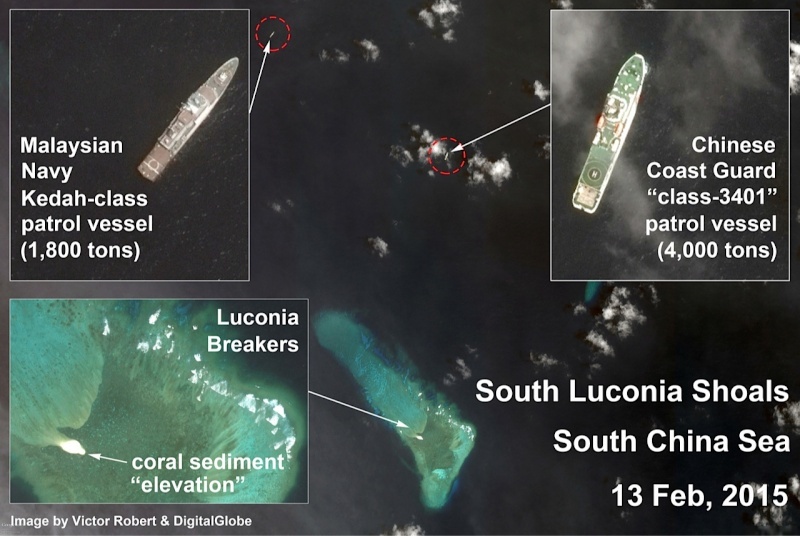 For Beijing, expansion between the Spratlys and Paracels would allow it to exceed the geographical limits of Southeast Asia, hoping to expand its power in the Indian Ocean to Asia South West. For Washington, it comes to sow pitfalls on the maritime Silk Road borrows Beijing to import, through the Strait of Malacca and the South China Sea, not less than 82% of its oil and 30% of its natural gas. Expect many arrogant homilies about Washington's duty to protect the freedom of navigation and incessant condemnations of Chinese aggression , all in counterpoint to the expansion of the New Silk Roads, Nova Bank development created by the BRICS and the Asian Investment Bank for infrastructure led by China, which has in its board other BRICS countries as well as Germany and other European countries, all as vectors of a multi-component strategy that undermines the hegemony of the US dollar. Gone are the early days of the reign of Obama, when Kissinger and Dr. Zbig- grand chessboard -Brzezinski proposed a special relationship between the US and China, a kind of G-2 unbalanced facto under the control of exceptionalist hegemonic power. Beijing might well beware. Today, the Obama administration has returned to its default mode, which is containment. Ash Carter only push things a little further. Besides the Cold War 2.0 is far from being defused, we are now dealing with a Cold War version of soy sauce or Won Ton. The neocons US had better beware because indigestion giant shrimp lurks. Dark reminiscence - Prelude to the Pacific War: 1941 was the year of the escalation between the US and Japan ... Following the refusal of Japan to withdraw from Indochina and China, excluding Manchukuo , the United States, the United Kingdom and the Netherlands decreed from July 26, 1941 the complete embargo on oil and steel as well as the freezing of Japanese assets on US soil . 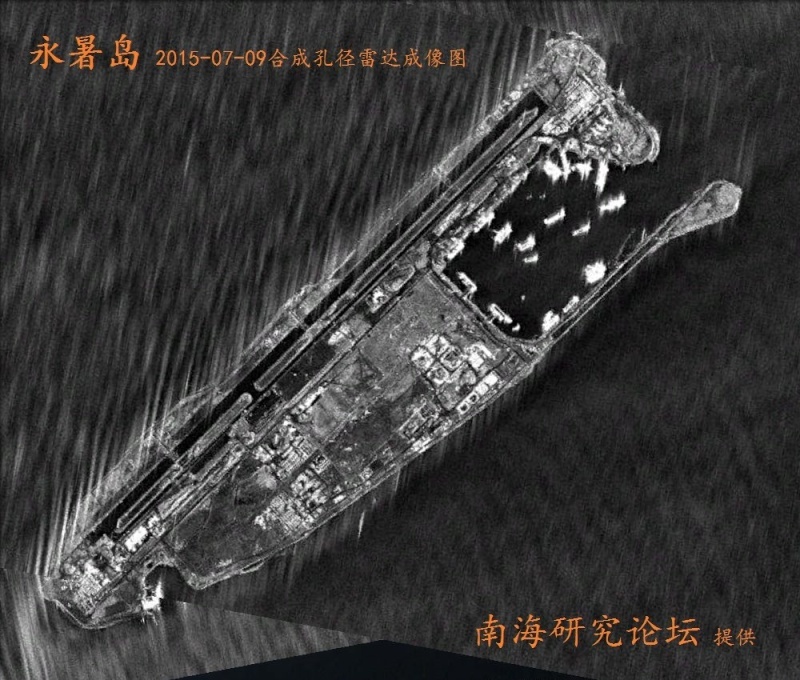 Picture of Fiery Cross island from May 31st. 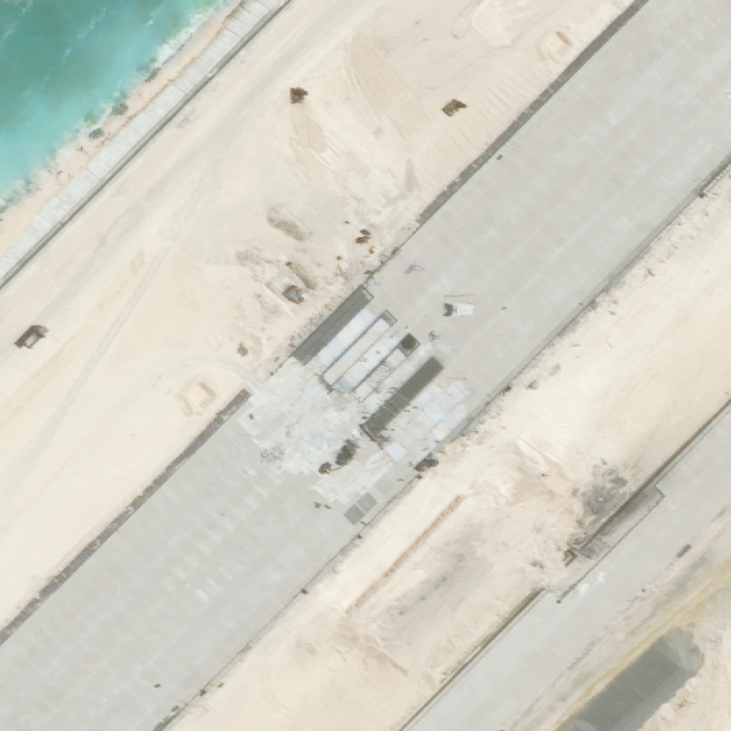 It seems airbase infrastructure is also in the process of building. I think in few months they could station first squadrons there. I find it astonishing and amazing. If i had the money i would pay the chinese to build me an island for myself and buy Mi-24PK-3. Werewolf wrote: I find it astonishing and amazing. If i had the money i would pay the chinese to build me an island for myself and buy Mi-24PK-3. max steel wrote: KEEPING AMERICAN PAID MEDIA PROPAGANDA AND SCARE MONGERING ASIDE . The truth is that, it is the White House in 1974 who backstabbed Saigon regime by providing no help when China attack Paracel Islands. A number of theorists believed that, the White House had ordered the Saigon navy to lost the battle, so that China can easily capture the islands. In the Sparkle Islands, Phillipines, Taiwan, Malaysia also captured a number of territories. It is said that the White House ordered Saigon goverement to keep silence when Phillipines, Taiwan, Malaysia violated and occupied Vietnam's territories. You may doubt the credibility of these theories, but it is as clear as day about the dirty hand of White House and Pentagon in the region. The White House backstabbed their vassals Taiwan and Saigon regime, sold them to China PR. And now it is playing the role of a "good guy" ? That makes me vomit. a real life Roanapur would be awe- on second thought it would be horrible actually . no such thing as sparkle islands in the place charlie. how murican of you to ignore your geography. I am sorry college, my bad, I mistype the name. Some new pictures from The Diplomat. We could see the quick progress in construction of islands. 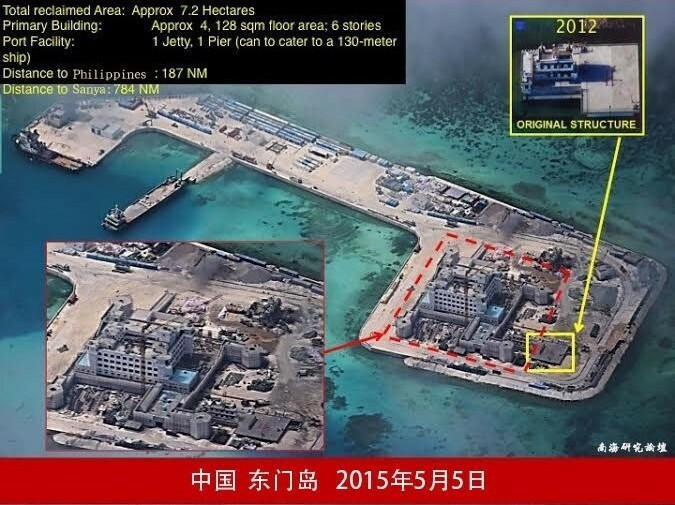 Some more photos from Fiery Cross island. 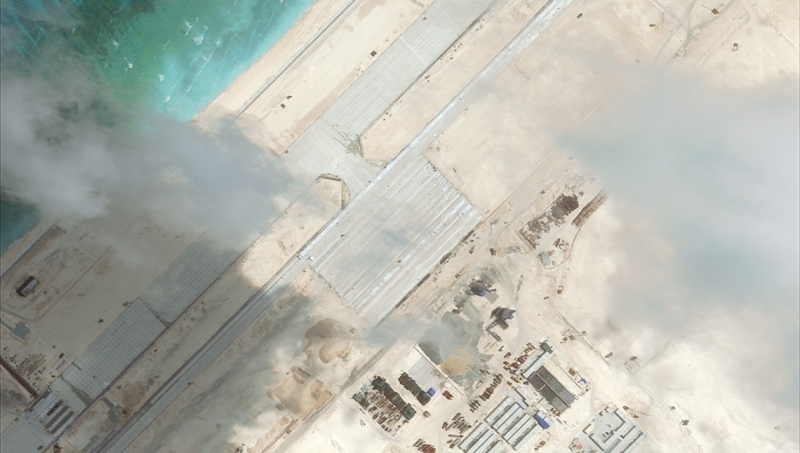 China will soon finish runway and taxi way and is building other airbase infrastructure. I hope they will soon build reservoars for fuel and warehouses for ammunition and they will be able to install first squadrons there. Control tower and buildings for personal are in the process of building. 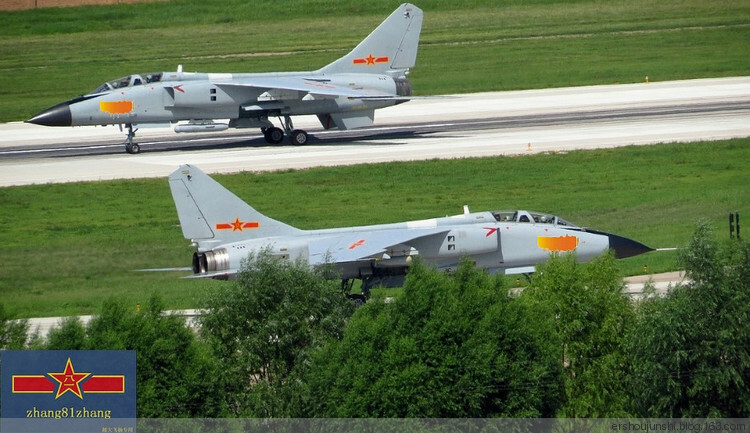 JH-7A is ideal for operations from Fiery Cross island and I hope we will soon see them there together with J-11. 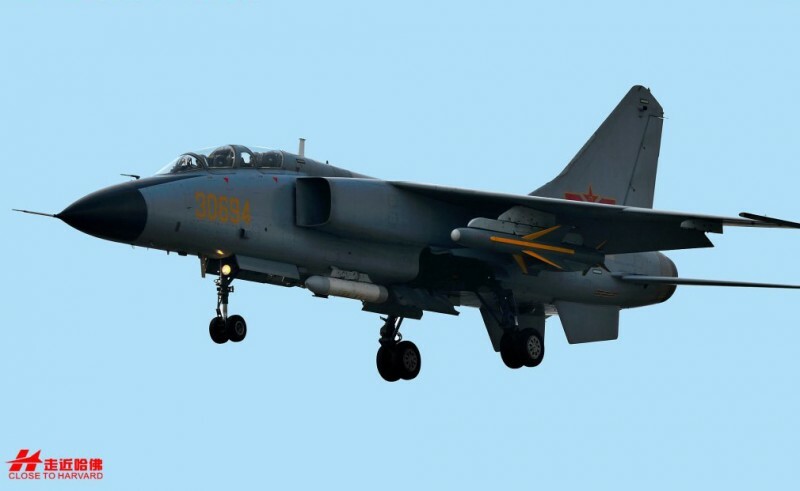 It carry 9 tons of various bombs and missiles and have a combat radius of 1500+ km. 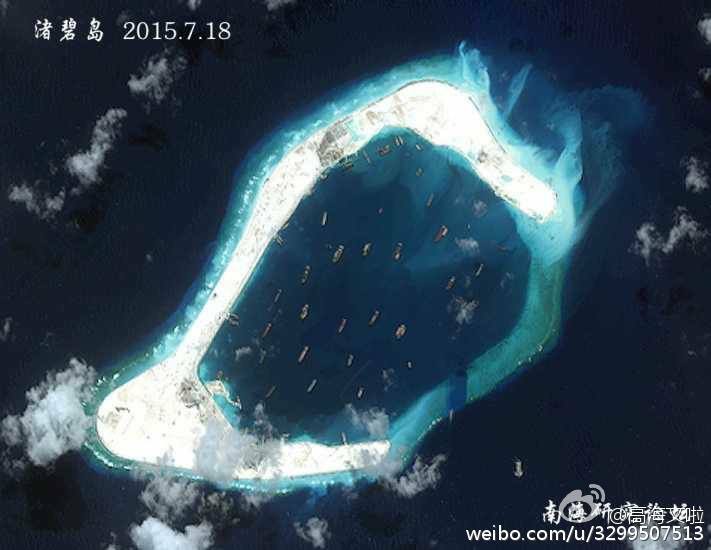 Picture of Subi island from June 30th. 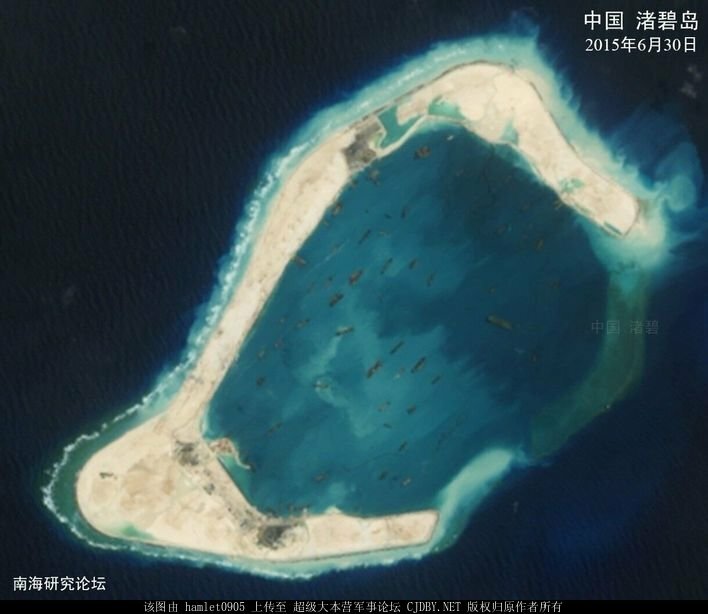 The island will be soon filled, so I hope China will soon start building airbase here too. 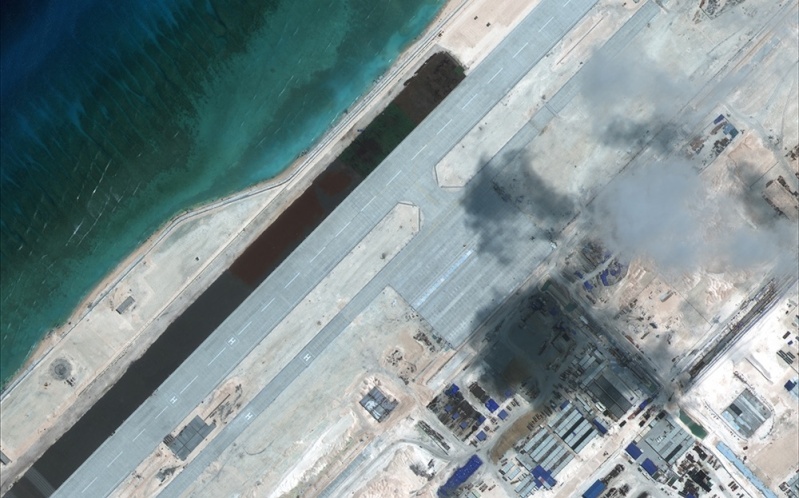 China will soon base J-11B fighters in Fiery Cross island, when runway is finished. 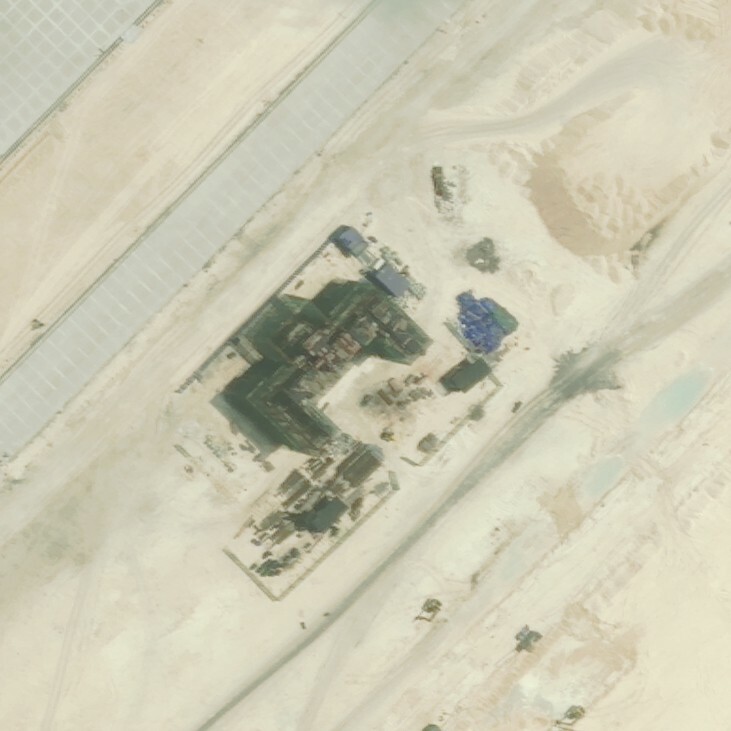 I think they will also soon finish all needed infrastructure for air base operation, like control tower, radar station, ILS complex, fuel storages, ammunition storage, maintenance complex and buildings for personal. 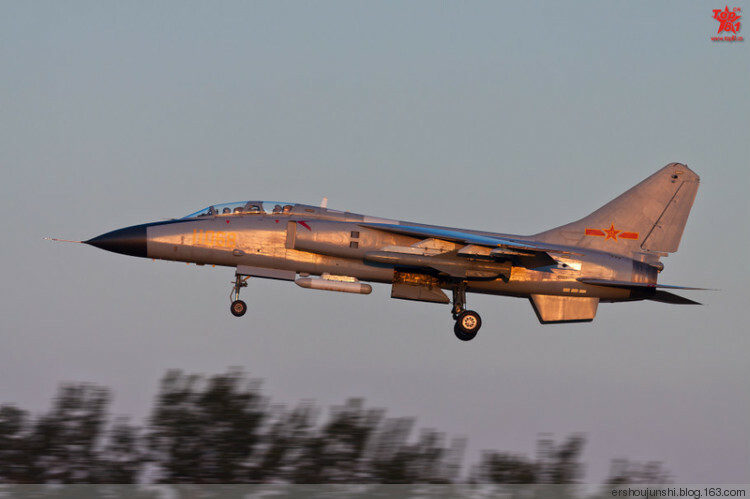 J-11B is multirole fighter with similar capabilities as Su-27SM3 with combat radius up to 1500 km. It doesn't have IFR capabilities, but for protection of islands it is not really needed. 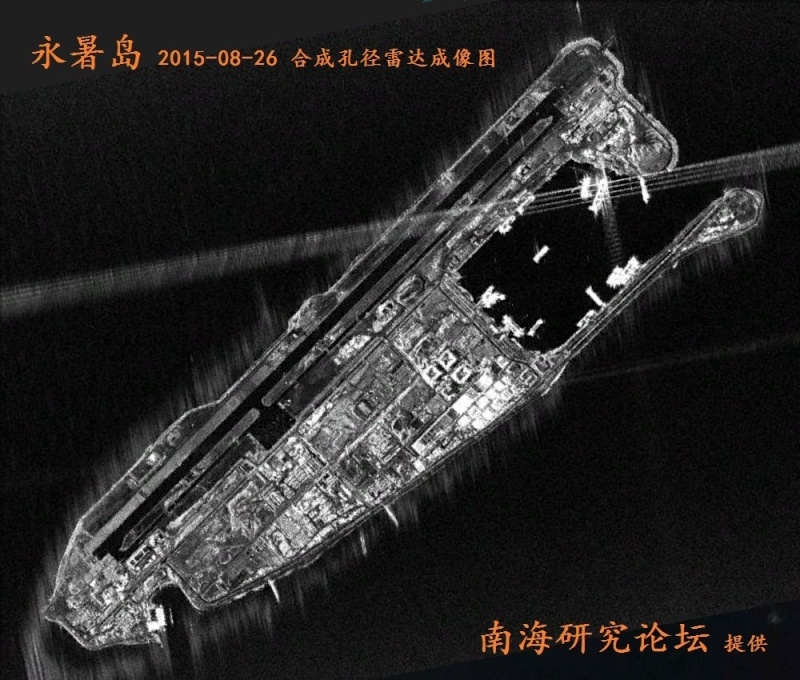 Radar picture of Fiery Cross island, runway, taxiway and apron is better seen. Woody island in Paracels. Enlargement and modernization of airbase will soon be finished. We will see, which planes China will station there. 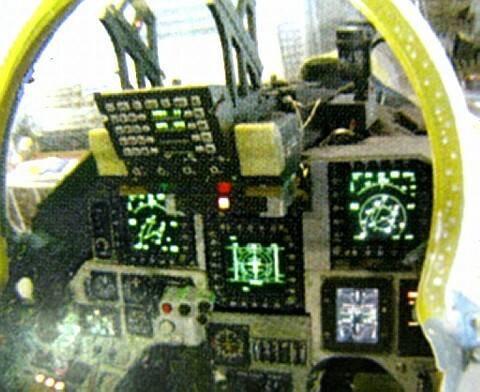 Most probably J-11B or JH-7A or both. Chinese Foreign Minister Wang Yi met with his Russian counterpart, Foreign Minister Sergey Lavrov, on Wednesday, on the sidelines of the ASEAN Foreign Minister’s Meeting in Kuala Lumpur. According to Xinhua, Wang told Lavrov that “China is willing to strengthen the strategic coordination with Russia on Asia-Pacific affairs to promote a common, cooperative, comprehensive and sustainable Asian security concept and jointly safeguard regional peace, stability and development.” It’s the latest indication that China is seeking to leverage Russia’s growing military presence in the region to advance its own security and defense interests in the Pacific. In part, that’s due to an increased Russia presence in the Pacific, particularly on the military front. In April, U.S. Admiral Samuel Locklear, then the commander of Pacific Command, told the House Armed Services Committee that Russia “has returned to … nearly a Cold War level of activity” in the Pacific. Russia is improving is strategic nuclear deterrent and submarine force on its eastern coast, in the north Pacific, Locklear said, and is “exerting increased influence not only in the Arctic… but also in Northeast Asia.” Russia has also been increasing its military presence in Southeast Asia, Locklear added. Japan has also noted increased Russian military activity. In fiscal year 2014, Japan scrambled fighter jets 943 times, a 16 percent increase over FY2013 and the second-highest rate ever. 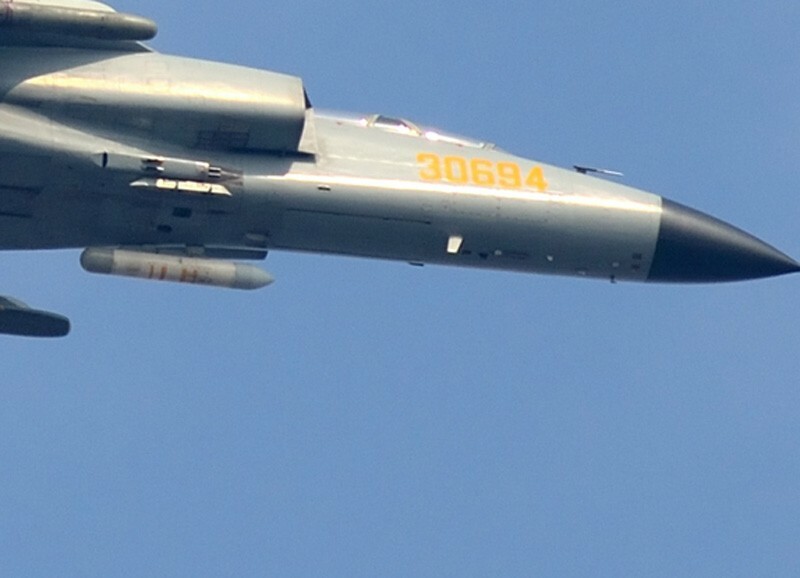 That increase back to Cold War levels was partly due to increased flights by Chinese fighters near the disputed Senkaku/Diaoyu Islands in the East China Sea, but equally due to Russian bombers and patrol planes passing close to Japan’s north. 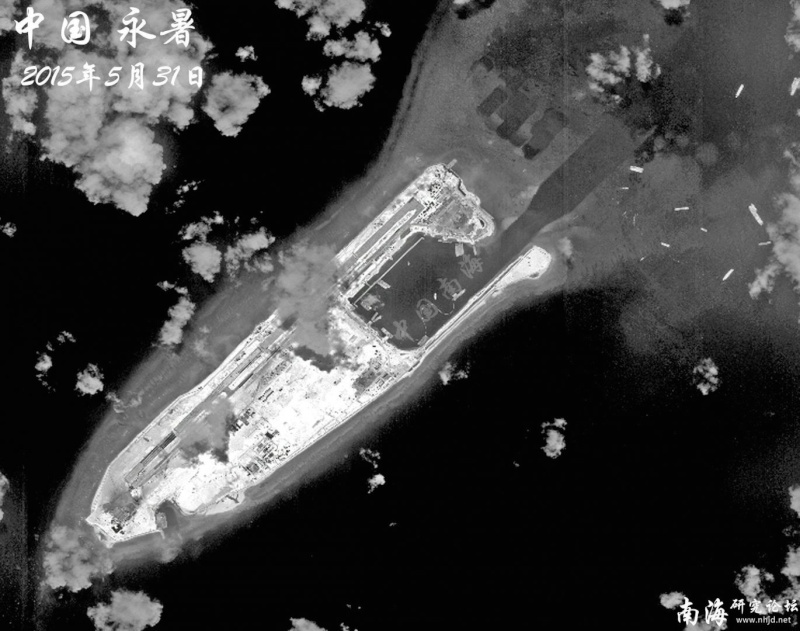 In fact, Chinese aircraft accounted for under half (464) of the scrambles, Japan’s Defense Ministry reported. Scrambles to meet Russian aircraft were up roughly four times from 2004 levels. Russia also recently announced that it will build up its military and civilian infrastructure on the Kuril Islands, which Japan claims at the Northern Territories, meaning Japan can expect Russia’s military presence in the north Pacific to continue to grow. China, meanwhile, seems to welcome this increased Russian presence. In addition to stepping up joint military exercises, including a planned naval drill to be held in the Sea of Japan later in August, China and Russia held their first-ever meeting specifically dedicated to the topic of Northeast Asian security issues in April. At the meeting, the two countries “agreed to enhance dialogues and coordination to promote peace and stability in the region,” according to Xinhua. For China, a more active Russian approach toward the Asia-Pacific provides a useful counterweight to U.S. influence in the region. Beijing also appreciates Moscow’s support on security issues, where the two countries often see eye-to-eye. Russia and China joined voices to object to the deployment of the U.S. missile defense system THAAD on South Korea, for example. 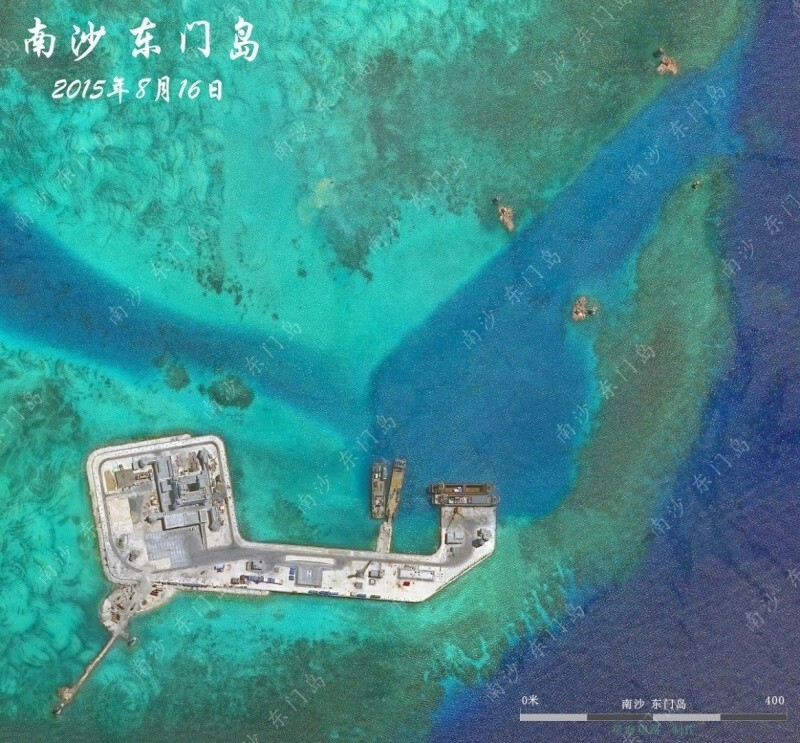 Still, despite Wang and Lavrov’s remarks about cooperation, China is unlikely to win rhetorical backing from Russia on the issue that will draw the most attention at this year’s ASEAN meetings: the South China Sea disputes. 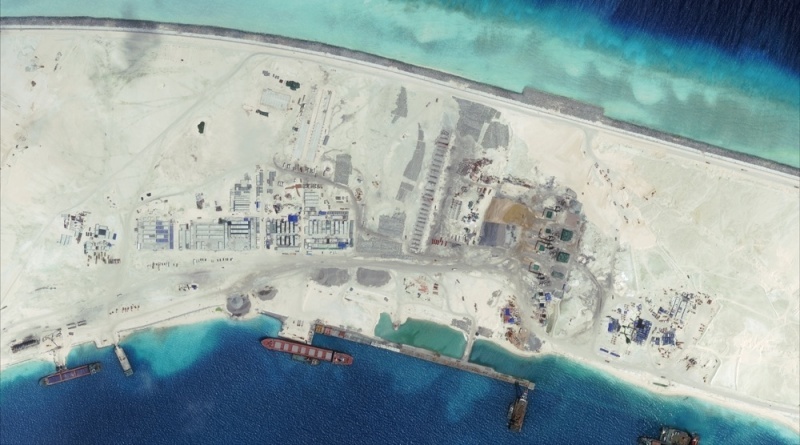 China has come under heavy criticism from Southeast Asian countries, Japan, and the United States for its land reclamation activities. Russia, meanwhile, has refrained from defending China – and has even sold six Kilo­-class submarines to Vietnam, one of the rival claimants. It’s precisely this close relationship with Vietnam that has prevented Moscow from giving moral support to Beijing on the disputes. 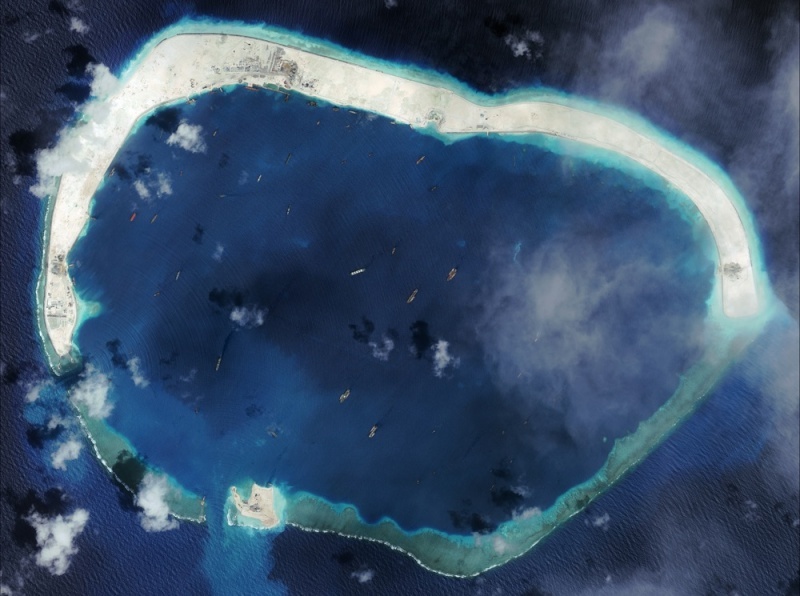 As Anton Tsvetov, media and government relations manager at the Russian International Affairs Council, put it in a recent article for Russia Direct, “Russia’s possible involvement in the South China Sea dispute would have been a no-brainer if another vocal claimant –Vietnam — weren’t also the country’s closest partner in Southeast Asia.” In its attempt to avoid antagonizing either China or Vietnam, Russia has adopted what Tsvetov describes as an almost “non-existent” position on the disputes. As a sign of Russia’s tightrope walk, there are plans for Russia to hold joint naval exercises in the South China Sea next year. 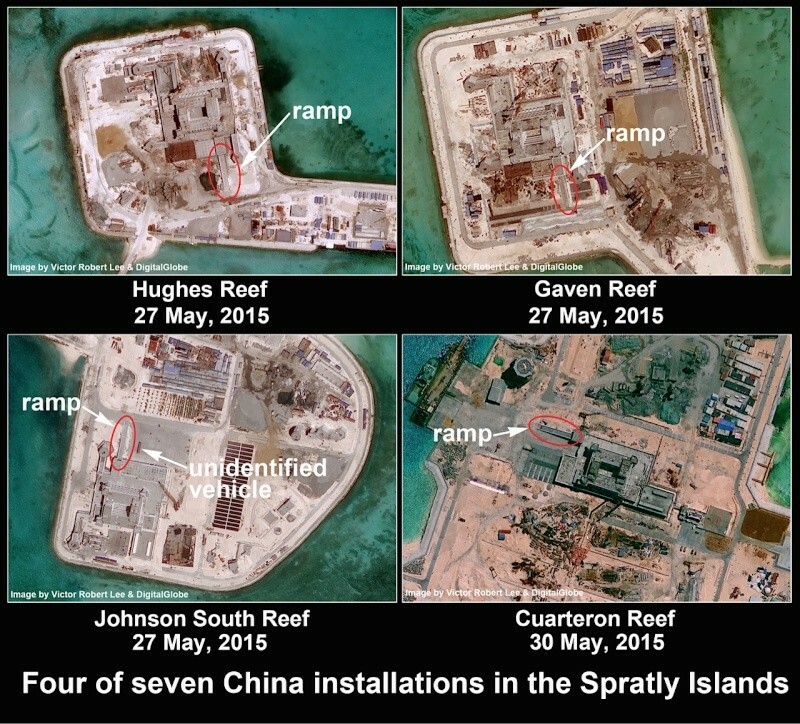 with its “Asia-Pacific allies,” which would likely include not only China but Vietnam as well. While China would appreciate diplomatic cover from Russia on the South China Sea issue, such support is not forthcoming. Still, Beijing hopes to work with Moscow more productively on Northeast Asian issues. Russia’s support will be crucial as China tries to advance its own security vision for the Asia-Pacific region — a vision where the United States plays a much diminished role. 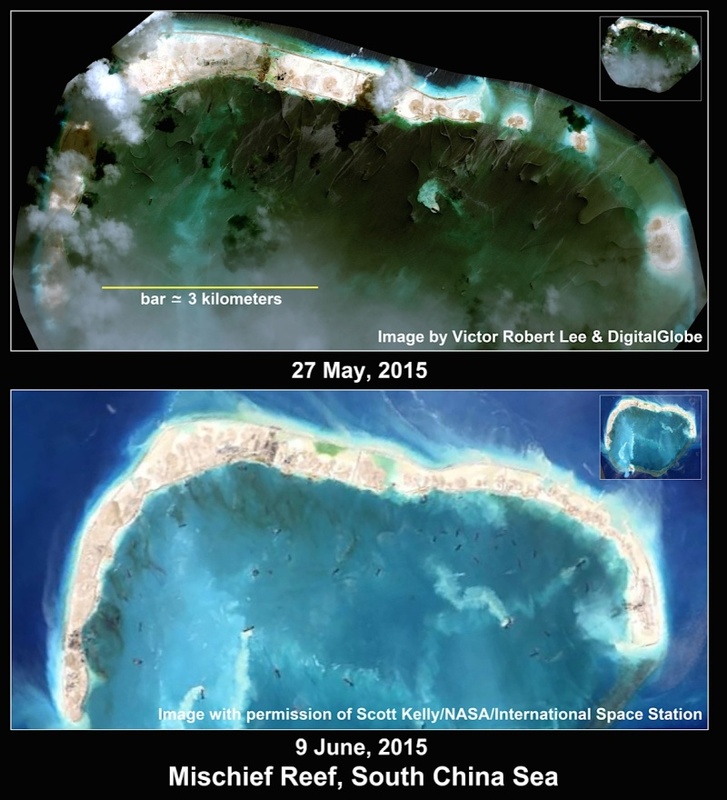 Newer pictures of three bigger islands. Some new pictures from August. 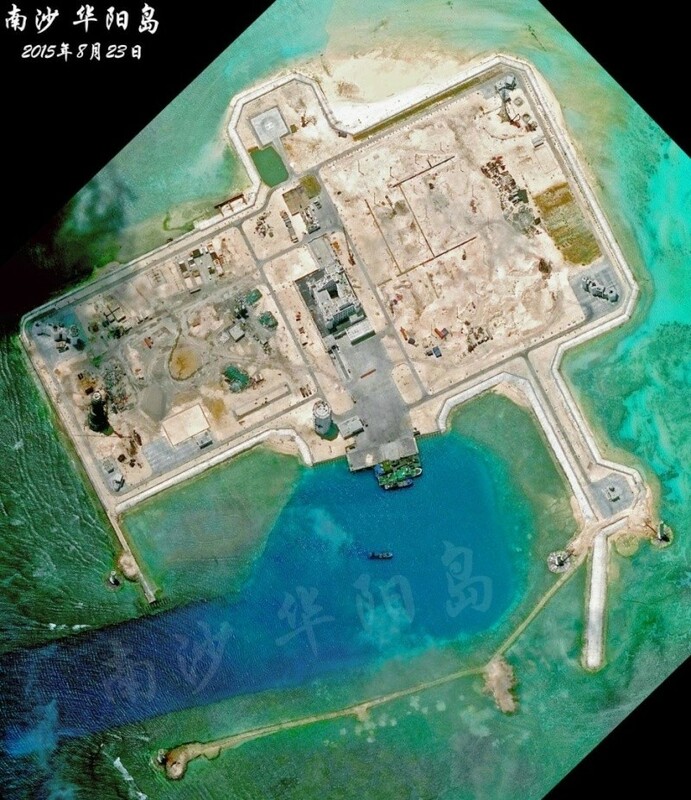 China is starting with building of an airstrip in Subi island and a naval port. 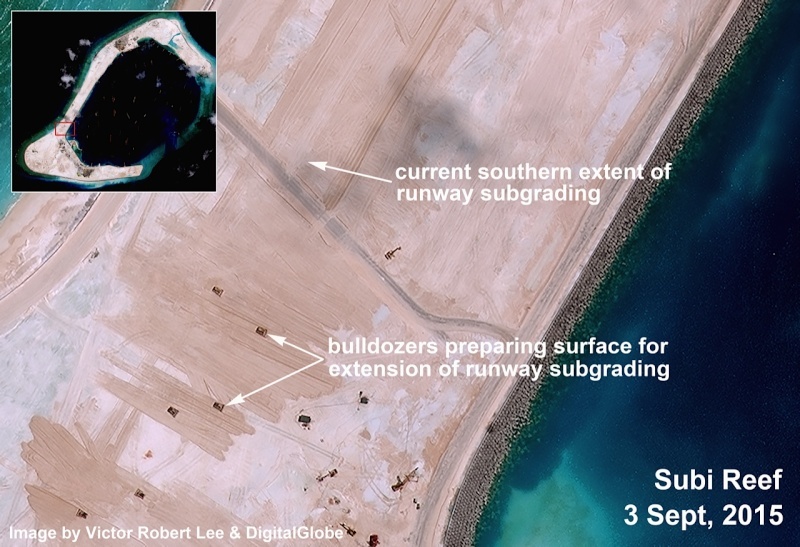 To the end of the year, China will have two airstrips in Spratleys. New pictures from Mischief reef. 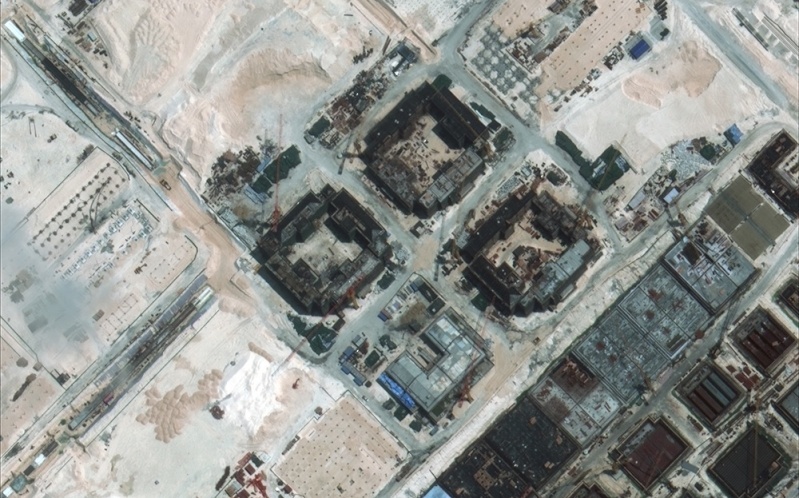 New pictures from Fiery Cross, there is intensive building of different objects. 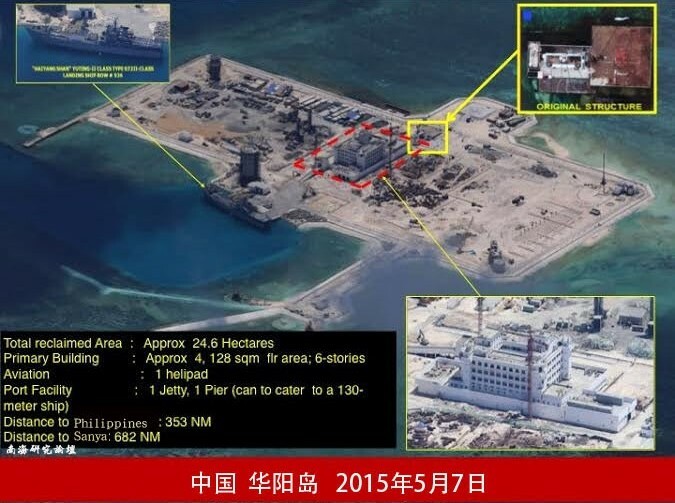 New photo from Fiery Cross island. Runway is finished, now they build infrastructure. It seems they also put soil and plant grass around runway to prevent sand to go on the runway. 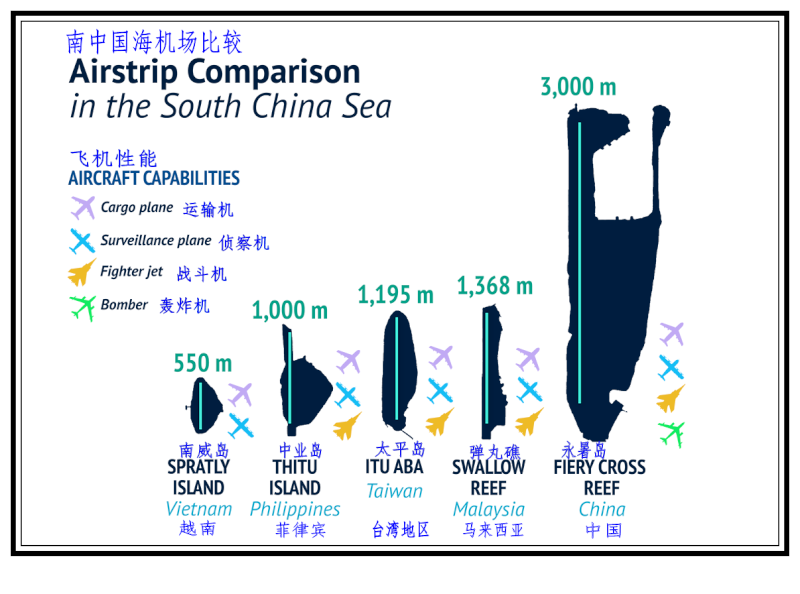 I hope to the end of the year China will be able to station first planes there. Japan, in the midst of a land dispute with China, scrambled fighter jets to prevent possible incursions by Chinese planes a record number of times from July through September, the Defense Ministry said on Monday. 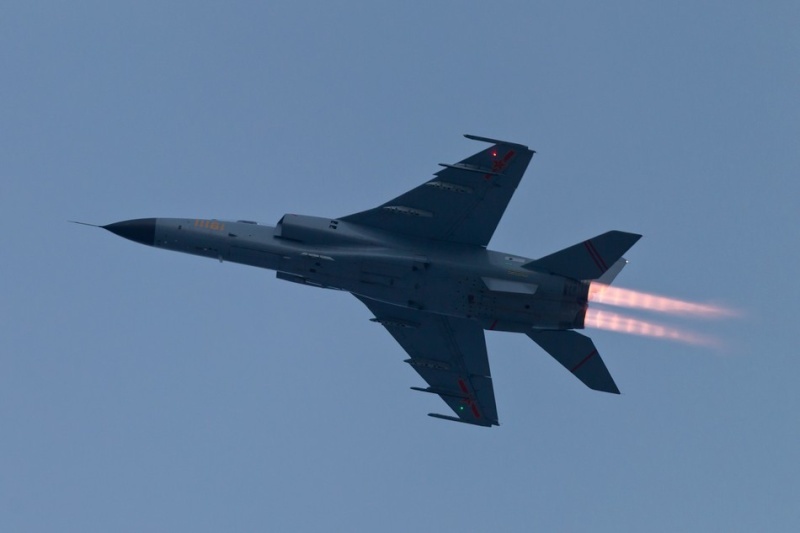 Japan jets scrambled 117 times, up from 103 in the same three-month period of last year, although it was lower than the all-time high of 164 times recorded in the final quarter of 2014, Reuters reported. However, it is unclear why the number of scrambles rose and the ministry did not offer an explanation. 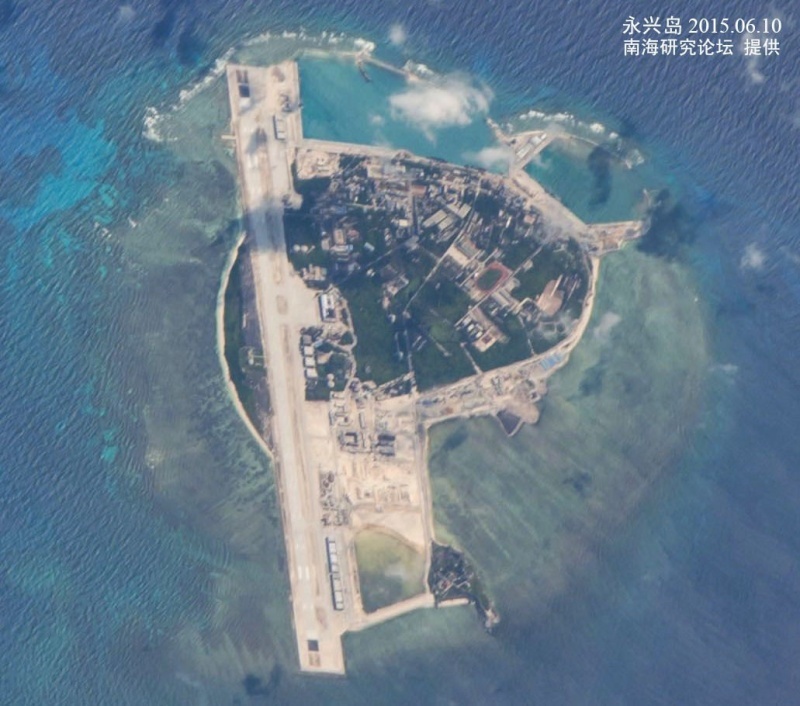 Japan and China are at odds over ownership of a group of tiny, uninhabited islands in the East China Sea, called the Senkaku in Japan and Diaoyu in China. Patrol ships and fighter jets from the two countries have been shadowing each near the islets, raising fears of a conflict. The countries are now working on a communication system aimed at averting misunderstandings between their militaries. Ties between Japan and China have long been troubled by their wartime history. But relations have improved slightly in the past year, despite Tokyo's bolder security stance and Beijing's increasing military assertiveness. Scrambles against Russian planes fell 43% from a year earlier to 51 times in July-September, helping to bring down the number of Japan's overall scrambles in the three-month period by 12% to 170, Reuters reported. Russian bombers and patrol planes often fly close to Japan's northern air space and four smaller islands claimed by both countries. 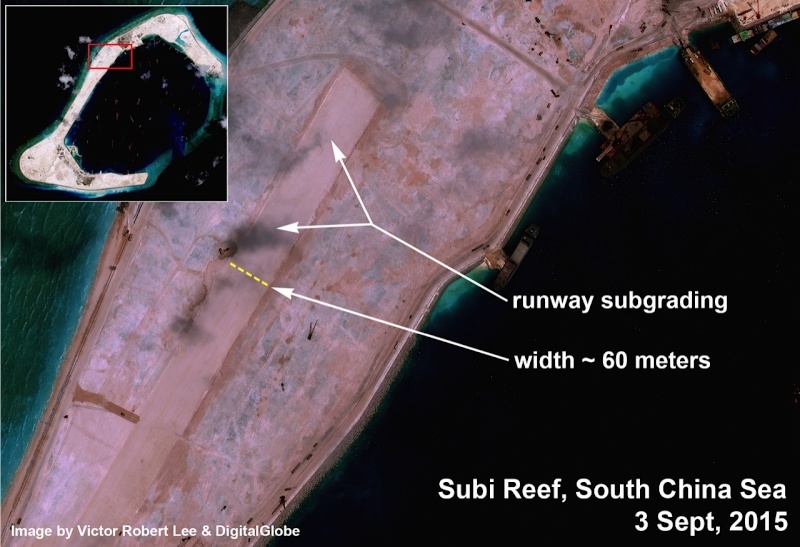 Construction of runways are going on both Subi and Mischief islands.